Kawana Island is a little piece of paradise in the Sunshine Coast suburb of Parrearra.The Mooloolah River meanders around the island on its way to the Coral Sea, just a few kilometres away at Mooloolabah. Zanzibar is located, appropriately enough, in Zanzibar Court and backs onto the river. Unsurprisingly, the owners were anxious to exploit the water aspect and maximise their exposure to northern light. 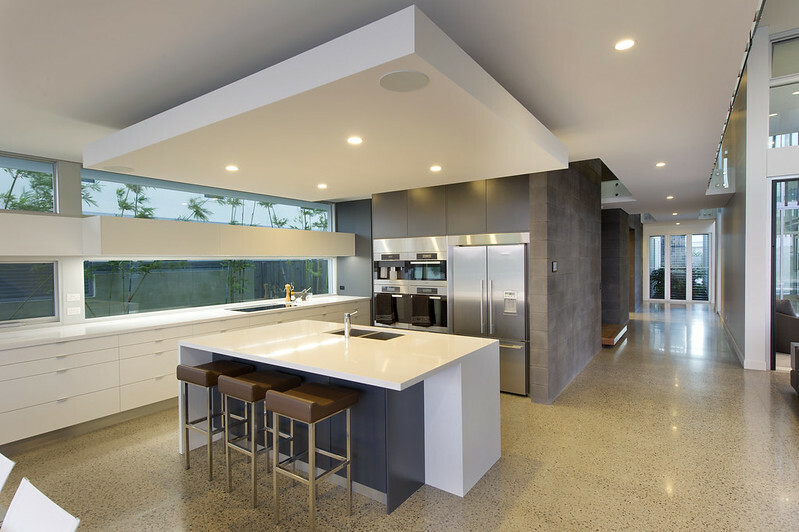 “Our client gave us a very open brief with a preference for a minimal, low maintenance, sustainable design,” says Michael Rolton of MRA Design who was assisted on this project by Chris Halliday. Austral Masonry GB Smooth masonry in Pewter is used in the spine walls that run along both storeys through the main breezeway of the house. The masonry is located internally and externally to maximise thermal mass – an essential component of an energy efficient design – and to maintain a visual flow between the indoor and outdoor areas. The Austral Masonry GB Smooth masonry chosen for this project has a smooth face finish. The GB Masonry Collection is also available in split face and honed, which exposes the natural aggregate surface to add a subtle sparkle.The Pewter chosen for Zanzibar is one of eight colours available across the three GB Masonry Collection finishes. The blockwork is laid in a stack bond, reinforced by starter bars, horizontal and vertical reinforcing steel and core filling. The 300 series (300 mm thick) blocks used as single skin external walling were given a waterproofing treatment. The internal face blockwork walls are all 200 series (200 mm thick). 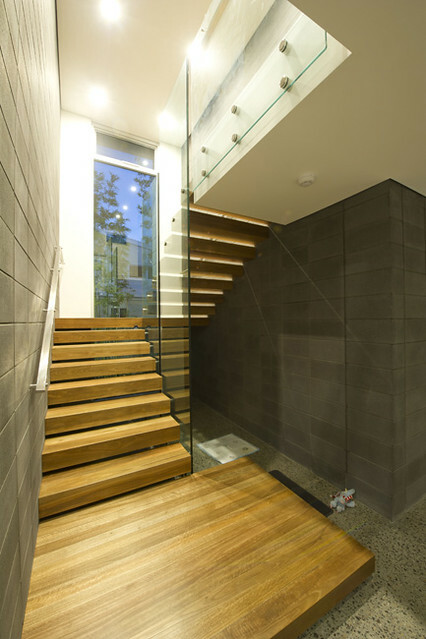 A dark coloured mortar complements the soft colour of the Pewter blocks. 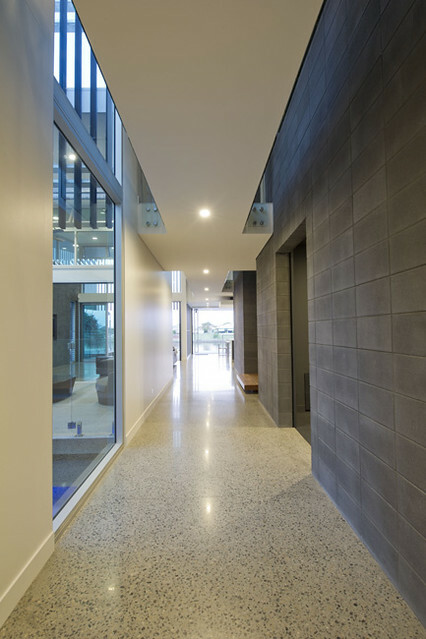 Austral Masonry’s 200 series grey blocks are also used extensively throughout the structure, in hidden locations and under render. In keeping with the climate and location, the landscaping is arid coastal.The owners have also erected a private jetty allowing speedy access to the river and then to the sea. Comfort is always top of the list on a build such as this. 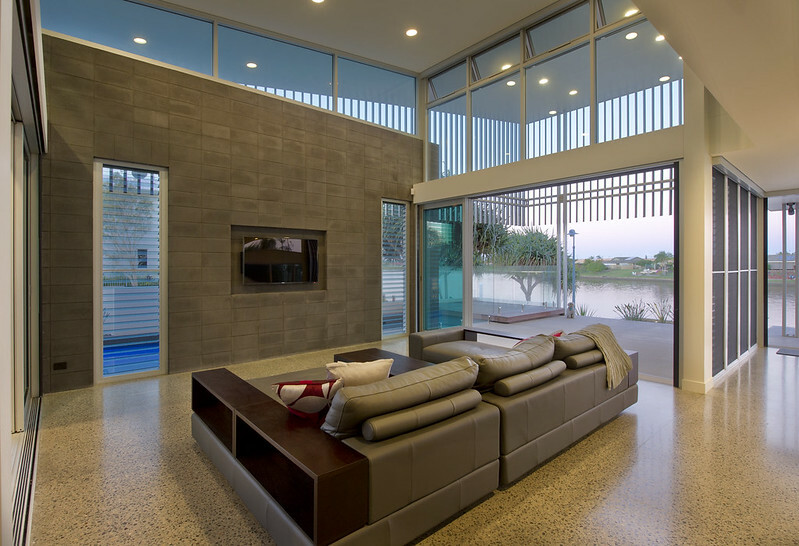 The home is fitted with a state-ofthe-art home automation system allowing the whole house to be remotely operated via an iPhone app. The thermal benefits of masonry will also add to their comfort and the extensive face blockwork will substantially reduce maintenance requirements. Paradise indeed! The smooth surface of GB Smooth masonry gives a soft glow to any project. The GB Masonry Collection of products are also available in split face, smooth and honed finishes.